Two former US intelligence chiefs respond to Donald Trump’s belief in Russian President Vladimir Putin, rather than American intelligence agencies, over Moscow’s interference in the 2016 US Presidential election. 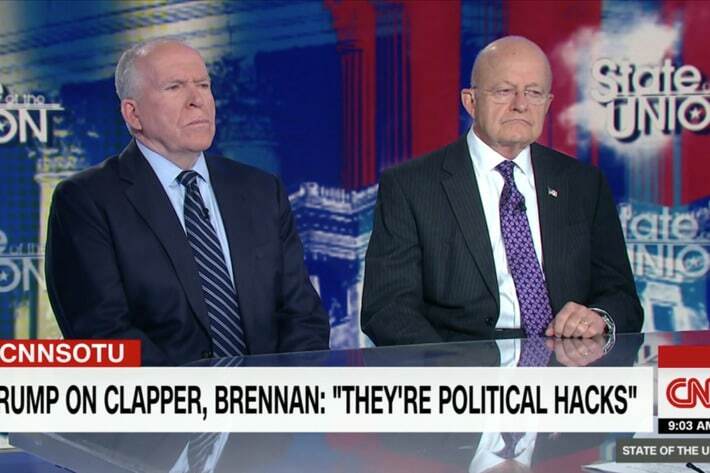 He then said US intelligence heads who have confirmed the Russian influence operations — former Director of National Intelligence James Clapper, former CIA Director John Brennan, and former FBI Director James Comey, fired by Trump in May in an attempt to quash the Trump-Russia inquiry — were “political hacks”. The threat posed by Russia, as John just said, is manifest and obvious and has been for a long time. Putin is committed to undermining our system, our democracy, and our whole process. To try to paint it in any other way is, I think, astounding, and in fact, poses a peril to this country…. I do think both the Chinese and the Russians think they can play him. The State Department will soon offer a $25,000 buyout to diplomats and staff members who quit or take early retirements by April. The initiative is part of Secretary of State Rex W. Tillerson’s continuing effort to cut the ranks of diplomats and civil service officers, with a goal of reducing almost 25,000 full-time employees by 8%. Tillerson has already frozen hiring, reduced promotions, asked some senior employees to perform clerical duties that are normally relegated to lower-level staff members, refused to fill many ambassadorships and senior leadership jobs, and fired top diplomats from prestigious posts while offering low-level assignments in their place. The head of the American Foreign Service Association, Barbara Stephenson, said the number of career ambassadors has fallen by 60% since January. Career ministers have fallen by 42% and minister counselors by 15%. Meanwhile, entry-level foreign service officer hires have declined from 366 in 2016 to 100 in 2017. Vacant posts include the Assistant Secretary of State for East Asian Affairs and the Ambassador to South Korea, amid the conflict over North Korea’s missile and nuclear programs and the headline issue of the US-China relationship. Despite Tillerson’s measures, State Department accountants have told him that only about 1,341 people are expected to retire or quit by his target date of September 2018. So $25,000 will be given to the first 641 employees who agree to leave by April. Tillerson’s cuts are intended to meet a 31% budget cut proposed by the Trump Administration. Despite legislators’ rejection of such a deep reduction, the Secretary of State has proceeded with cuts.